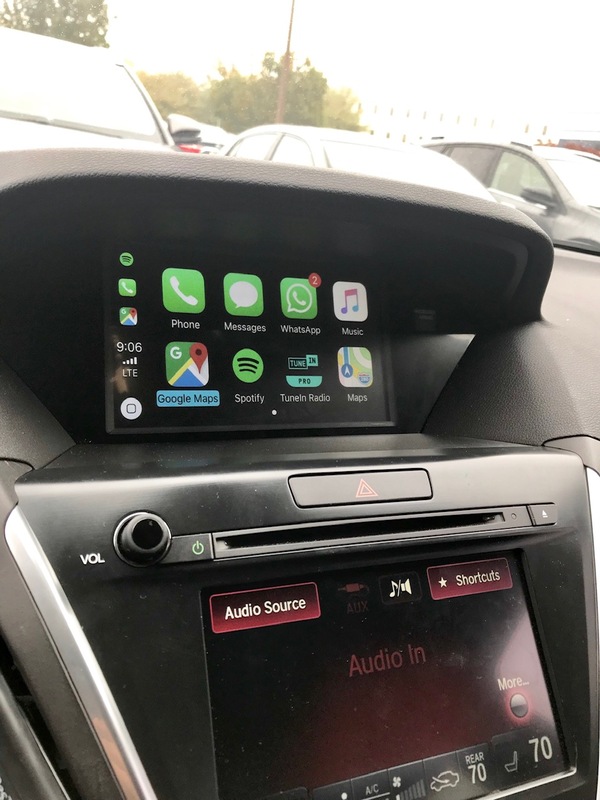 Acura MDX Forum : Acura MDX SUV Forums > Model Specific Discussions > Third Generation MDX (2014-Present) > CarPlay Navtool installation scheduled! Just scheduled the installation of Navtool in my 2016 MDX. I'm hoping it works as promised and will feel like a factory option, since it will be controlled using the factory controls. If it does, it would be awesome to have have carplay and Google maps in my MDX! Stay tuned! The installation is scheduled for Tuesday. I was burned by the Navtool guys and against my better judgement, I decided to try their AA/Carplay so I ordered one this week. I have AA on my Chevy and it is great. I am a big Waze user. The main difference is that on the Chevy, the AA interface is on the nice 8" touchscreen - no joystick nonsense. So interaction is quick and not distracting. While on the MDX you are severely limited because it does not use the bottom touch screen but you are stuck using the joystick. It would be dangerous for a driver to use a joy stick while trying to drive! So if you are using Waze, it is not a quick and clean interface at all. But still, I'll give it a whirl despite that limitation. At least I'll be able to see the screen clearly, much better than the phone itself. Be aware there is a 10% discount coupon out there that does work so it saves you $50. They took my money and gave me a tracking number the following day. Days later, they have yet to give gave the package to Fedex. I emailed them but no response. I have a bad feeling this might be a bad sign given my history with them. How long did it take them to ship yours from the time you ordered? I live in NY. Their store is on Staten Island and a local installer in Staten Island is installing it for me. They are charging me $500 for Navtool and $200 for the install. The installer has an account with Navtool and I'm not buying it directly from Navtool. All I have to do is bring my car to the installer and pay them........that's it. They said it'll take little over an hour to do the work. Hopefully, in an hour, I'll be driving with CP in my 2016 MDX. If it works the way the demo works, it will look just like factory install! Having the ability to have TuneIn, Spotify and Google Maps right on the screen would be awesome. I'll let you guys know how it turned out....maybe add some pics. I ordered one for my mdx over a month ago and it just came in. Their support is is unprofessional but at least they have responded so far. Problem is now it's missing the remote thing. I am starting to think I should just send it back. - Went to the installer at 8am on Sunday morning. 2 hours later, the installer says it's not working, cables are missing, updates not working...etc, etc. - Installer calls NavTool and the actual owner of NavTool (the guy who does the youtube videos for their products) comes to the installer and takes over. Does various software updates to the box. Eventually, it works, however, the menu pops up when you turn on the left turn signal. Its supposed to turn on CP when you press and hold the back button...not the turn signal. Another two hours go by with no progress. - The owner of NavTools tells me that they need to do another update and the update is actually being prepared by the software engineers at the office in New Jersey. - The owner asked me if I can bring the car to the office. Since I was headed in that direction, I decided to give it one more shot. - The owner and 2 of his engineers worked on the software testing it with my car for 2 hours. Finally, it was done! It works! - The owner took $100 off the bill for my troubles. - I leave the office to head home and 10 minutes in to the drive, CP stops working and doesn't recognize any phones attached. Called the owner back he asked to please bring it back and he'll look at it for me. He said that everything should work and something maybe loose. - Took the car back (was only 10 minutes away) and he said the issue was the charging cable I was using. He said I will need to use an apple certified or original apple charging cable. - He gave me another cable (not apple original) and it worked....so off I went. - After about 40 minutes, it stopped working. Since it was not an original cable, I decided to wait. - After getting home, I installed an original cable and its working so far. However, I have not driven it no longer than 20 minutes at a time. I'm hoping the original cable and the software updates solved all issues. So, now that it "seems" stable and working as intended, I love it. Its just so awesome having google maps and Spotify on the main screen. All factory buttons and functions seems to working fine. CP uses the center dial for navigation around the menu and works seamlessly. Step by step: I get in the car, plug my phone in, start the car, wait for the system to start up (10-20 seconds) and then the menu pops up for CP. Click on it if you want car play or just hit back button not to launch CP. Once launched, you can switch between any audio source and keep CP display on the main screen. Keep in mind, if you need the audio from CP, you have to keep the audio source set to AUX. Also, for phone calls and siri, I use the steering wheel button and bluetooth. I discovered there is no MIC on CP. You "could" install a mic but that was going to cost extra and I'd have to go back to the installer to get it done. I dont need it because phone calls work great from bluetooth and car mic and steering wheel controls. CP displays all the pone call info, etc just fine. So far, its working just like the way you see it on the youtube guide for 5.0 version. I'll update this forum if I run in to any issues in the coming days. So far, I love having Google maps and all the traffic info on my screen and the ability to use tune-in, spotify, etc directly from the MDX head unit. E92Vancouver, neoshi, gnne60 and 1 others like this. Use apple certified cable, i had same problem with amazon purchased cable, i ended up buying 8 feet certified cable and it was all good, also extensions are not recommended, so use straight cable to the interface. Just to clarify, you initiate a phone call using the steering wheel controls and the dash display of your resents / favourites? When you hit Call on the steering wheel, CP displays your call info, but the audio input auto switches to Bluetooth and then auto switches back to AUX when you hang up? Can you hang up from CP? How does the jog wheel feel for controlling the CP menu? Can you enter text easily for addresses, etc? Excellent stuff! A little concerned about how many software issues it had but will keep watching. Wish you also had an Android phone to test that. A part of me is wondering if the new android auto/carplay cpu that acura put in is basically a similar device, since it also has an activation button along with connection to the stock jog wheel for control. Will have to study it one day. Good luck! I'm a pass on this. I will upload a video of how it's working in my car sometime this weekend. Regarding phone calls, yes, you press talk on the steering wheel, you can dial from your favorites, or recently called numbers, displayed on your dash....and it will dial the call via bluetooth. When it does, the contact info and all the call details appear on the screen in CP. You can hang up on CP or the steering wheel. You can initiate the call via Siri or from CP, as long as you have the MIC option installed. I didn't know there was a mic option. I'm getting the MIC installed tomorrow The owner (thank God I live in NY) said he'll install the MIC at no cost. Pretty good service so far. Spotify, TuneIn and Google Maps has been working seamlessly. Great seeing real time traffic and satalite view on the screen at all times. neoshi and philharmonic like this. OP probably got carplay android auto 2 in 1, my unit was carplay only so i didn't have to do any updates, i did receive an email from navtool offering free software upgrade to carplay and android auto 2 in 1. Yeah, but the installation does not go as smoothly as the video shows! I was lucky that the Navtool owner was close by and actually worked with his engineers to get it up properly. Once whatever software updates they did to my unit is on all other boxes, I'm guessing there wont be any issues for future users. There are some bugs definitely. There was a random time that that I put the car in reverse and the factory real camera did not come on. I unplugged the phone, plugged it back in and it reset the CP connection and the issue went away. A little more polishing of the product and this thing is amazing. I'll update more after the MIC install. After this MIC install, you can search within google maps using voice and set destinations via CP. Awesome! MY Version is CarPlay Only so i never have any issues, i will update to latest version with Android auto and see how it works, as my wife now now has android phone. It looks like i will not be selling my car as cant get a good trade in value, so i will do an update to see how it works. I wish I could use the factory controls with my 2012 MDX. I'll be following your post to see how the update goes.